Reviews of ¿Cuánto pesa su edificio, Sr. Foster? 2010 ( GB ) · English · Documental · G · 78 minutes of full movie HD video (uncut). You can watch ¿Cuánto pesa su edificio, Sr. Foster?, full movie on FULLTV - Traces the rise of Norman Foster, one of the world's premier architects Norman Foster and his unending quest to improve the quality of life through design. Portrayed are Foster's origins and how his dreams and influences inspired the design of buildings as Beijing airport, the Reichstag, the Hearst Building in New York and works as the world's tallest bridge, the Millau Viaduct in France, among others. You are able to watch ¿Cuánto pesa su edificio, Sr. Foster? online, download or rent it as well on video-on-demand services (Netflix Movie List, HBO Now Stream), pay-TV or movie theaters with original audio in English. This film was premiered in theaters in 2010 (Movies 2010). The official release in theaters may differ from the year of production. Film directed by Carlos Carcas and Norberto López Amado. SCREENPLAY ¿Cuánto pesa su edificio, Sr. Foster? Screenplay written by Deyan Sudjic. ORIGINAL MUSIC ¿Cuánto pesa su edificio, Sr. Foster? Soundtrack composed by Joan Valent. Film produced and / or financed by Coproducción Reino Unido-España; Art Commissioners and Aiete Ariane Films. As usual, the director filmed the scenes of this film in HD video (High Definition or 4K) with Dolby Digital audio. Without commercial breaks, the full movie ¿Cuánto pesa su edificio, Sr. Foster? has a duration of 78 minutes. Possibly, its official trailer stream is on the Internet. You can watch this full movie free with English subtitles on movie TV channels, renting the DVD or with VoD services (Video On Demand player, Hulu) and PPV (Pay Per View, Movie List on Netflix, Amazon Video). How Much Does Your Building Weigh, Mr. Foster?, full movie English 2010 ¿Cuánto pesa su edificio, Sr. Foster? 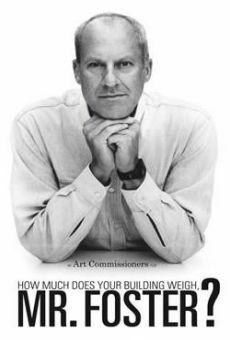 How Much Does Your Building Weigh, Mr Foster?, full movie English 2010 ¿Cuánto pesa su edificio, señor Foster? Ile wazy kon trojanski?, full movie Polish 2008 ¿Cuánto pesa el caballo de Troya? Full Movies / Online Movies / ¿Cuánto pesa su edificio, Sr. Foster? - To enjoy online movies you need a TV with Internet or LED / LCD TVs with DVD or BluRay Player. The full movies are not available for free streaming.